Police yesterday discovered the real name of the gunman who shot and killed prominent government critic Kem Ley when the shooter’s wife, who lives in Siem Reap province, came forward and identified him. Mr. Ley was shot in the back and in the head at about 9am on Sunday morning in a Star Mart cafe next to a Caltex gas station on the corner of Monivong Boulevard and Mao Tse Tung Boulevard. The gunman was arrested soon after the incident and confessed to shooting Mr. Ley over a supposed $3,000 debt owed to him. 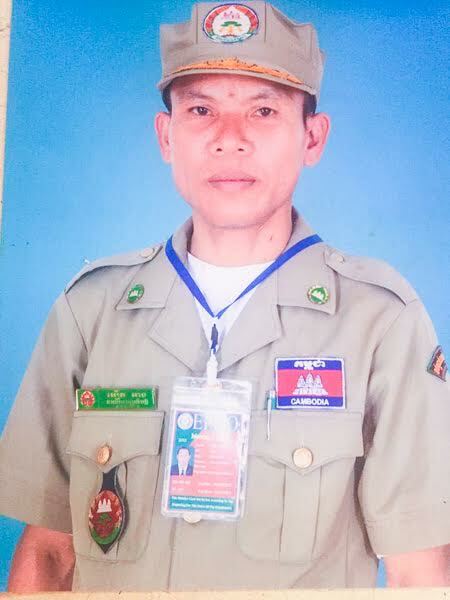 The man told police his name was “Choub Samlab,” but police did not believe him because the words mean “meet to kill” in Khmer. He told investigators he was from Banteay Meanchey province and worked as a crop farmer in Sa Kaeo province in Thailand. Because of the fake name, police were skeptical of his initial answers to their questions. Chuon Sovann, Phnom Penh’s municipal police chief, said the gunman was sent to court for questioning yesterday evening after police discovered his real identity. Mr. Sovann declined to comment further, but confirmed the man’s real name was Eurth Ang. “After the investigation is completed, I will explain this case in detail. For now, the court will continue the procedure and investigation,” he said. Speaking by phone with Khmer Times yesterday, Eum Huth, a 45-year-old pork seller, said she had been married to the gunman for two months and lived in Angkor Chum district’s Norkopheas village. Ms. Huth said her husband was a widower and she was widow with a 14-year-old daughter. She did not know what kind of work Mr. Ang was involved in, but said he was an avid gambler and left Siem Reap for 10 days for what he told her was “personal work” in Phnom Penh. “I have never heard that anyone owed him money. We are so poor. I’m sad if he killed him,” she told Khmer Times. Siem Reap provincial environment department director Phuong Lyna denied rumors the man worked there. Video footage posted to Facebook yesterday showed an interview with radio news outlet VOD and an elderly woman holding photos of Mr. Ang and claiming to be his mother. The 64-year-old woman, Ek Tam, also lives in Siem Reap province. She told the VOD journalist that she was surprised to see her son’s face on the news on Sunday afternoon and doubted it was him at first. Ms. Tam said her son was a monk for four years before taking a job in Thailand with a neighbor. She claimed to have heard that her son lent someone $3,000, but never received it back. “If I knew what was happening, I would not have let my son do such a crazy thing. Everyone’s life is very valuable. I could have held his hands. It’s heartbreaking for me now. I knew nothing about this,” she said. Ly Sophana, a spokesman for the Phnom Penh Municipal Court and a prosecutor in this case, said yesterday that Mr. Ang was sent to court for questioning and then taken back to the municipal police station for further interrogation. Mr. Ley’s death made international news, sparking condolences and responses from a variety of public figures and organizations. Many human rights officials and opposition members have said the shooting was politically motivated due to Mr. Ley’s frequent and harsh criticism of the government and Prime Minister Hun Sen.
Days before his death, he participated in a media roundtable discussion about a recent Global Witness report tying Mr. Hun Sen and his family to many of the nation’s largest corporations. The premier shot back at those pointing the finger at him yesterday, telling the crowd at the inauguration of the National Military Police building that the “cruel” murder was similar to the case of a gunman who shot and killed tycoon Ung Mengcheu in Phnom Penh in November 2014. He acknowledged that many believe the government was behind the shooting and accepted criticism from others who said Mr. Ley’s death, at best, represents the lack of safety provided by the government. But he asked his critics to give police time to investigate the murder to “find the real perpetrator and accomplices” and punish them legally. He added that politicians were accusing him without any facts or reasons to back up their claims. “This is seriously affecting the government’s honor. Who benefits from this murder while the government is talking about safety and security for its citizens? I think this point shows that it is a defeat for us,” Mr. Hun Sen said. In a press statement released on Sunday evening, the US State Department said it was “deeply concerned by reports of the tragic killing of prominent Cambodian political commentator Mr. Ley. 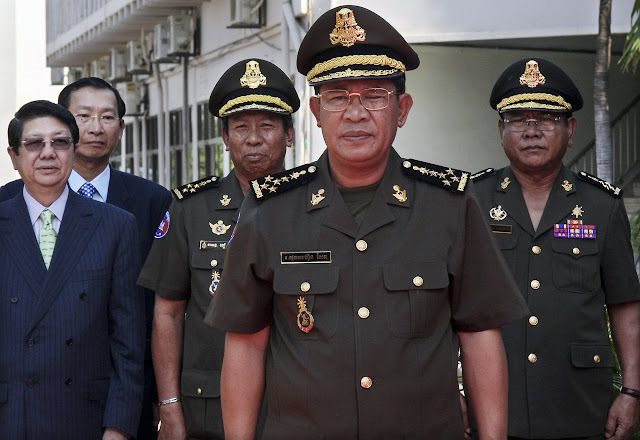 “We are following developments in this case closely, noting the Cambodian government’s call for an investigation, and urge that authorities ensure this process would be thorough and impartial,” said US State Department spokesman John Kirby. Seventy civil society organizations, NGOs and religious groups signed a statement condemning the murder and calling for justice for Mr. Ley’s pregnant wife and four sons. 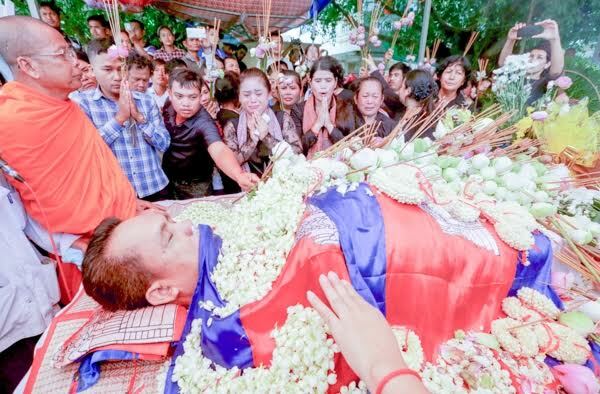 Mr. Ley’s body is now being kept at Wat Chas pagoda in Chroy Chongva district. The family said he will be cremated after 10 days, giving some time for his supporters and relatives to mourn. Yesterday, politicians, diplomats, unionists, NGO staffers, journalists and local residents went to the pagoda to pass on their condolences and mourn.